In detail, many believe that there are a few food agents that cause negative behavior or learning results due to a general disagreement with the body in general. One agent, gluten, is a type of wheat that many are allergic to and we are just now beginning to grasp the scope of the problems that gluten can cause. Another agent is casein, a protein that is found in milk and other dairy products as a binding agent. These two can cause many problems for anyone, much less those with behavioral problems already, like an individual with autism would be. The self-imposed dietary restrictions that individuals with autism put themselves under already cause problems with the growth or health of the individual. Add to this the problems caused by gluten or casein and the problem may grow. In this case, many medical professionals have begun attempting to find a diet that would suit an individual with autism by eliminating gluten and casein while still providing the other benefits those foods would bring to any other individual. This is just one example of how a doctor or therapist may try to regulate behavior with a diet or nutrition plan, others do exist. 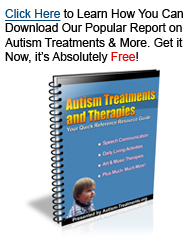 Consulting your doctor or therapist about this particular treatment would be in your best interest and the best interest of your loved one with autism.